SKU: PNK04. Categories: Party & Event, Miscellaneous Party, Casino Equipment. Tags: casino wheel, dollar wheel, prize wheel. This roulette wheel comes with the wheel, a felt layout, and a chip rake. Great item for any casino party. We also carry roulette chips which are rented separately. Roulette chips are rented by the 100 chips/color. These chips come in a wide variety of colors. The colors available are red, white, navy, orange, black, green, pink, yellow, and royal. These chips are used specifically for roulette. Each player uses a different color chip to designate their bets that are out on the layout. 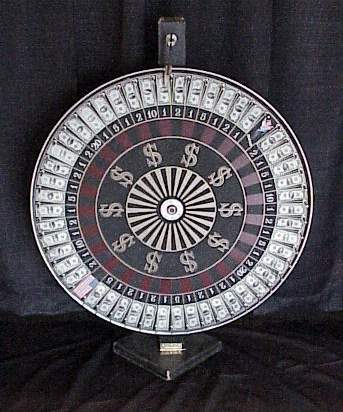 We also carry a roulette wheel which is rented separately. Great for casino parties.